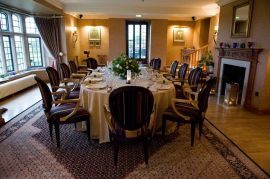 Whether you are planning private parties for a birthday or anniversary celebration, each one of our events is managed by an experienced and professional team. Party menus are devised by executive chef Niall Keating. Daniel Davies our sommelier will craft the perfect wines to accompany each course and organise the champagne. Our bar team will create expertly mixed cocktails and keep your guests entertained until the early hours. The Garden Room is the perfect place to host up to 30 guests, with views into the gardens and direct access onto the south facing fountain terrace for pre-dinner drinks on a balmy summers evening. The Garden Room complete with terrace can be hired for informal meetings, private functions, cocktails or private dining. 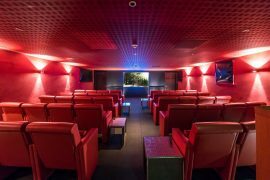 The cinema (40 seats) is also available for private hire and business use. Food and beverages must be purchased from us. 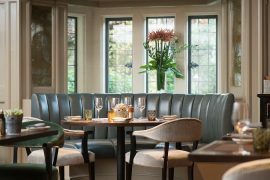 If you love great food, enjoy cocktails, appreciate good wines and taking time out to just unwind, Grey’s Brasserie is the place to be. Book this space for your private event or party. Maximum 65 guests. The Green Room has undergone a dramatic reinvention to create a vibrant new hub for food and drink enjoyment. The Green Room features a newly kitted-out kitchen and bar, fitted with Gaggenau’s latest kitchen appliances and gadgets. The Green Room, was previously a low-key private function space. It’s now been transformed into a vibrant hub for culinary events including for your exclusive private and corporate hire for up to 24 guests.